Pope Francis completed his landmark visit to the UAE on Tuesday, with an open-air Mass for 180,000 people, before returning to Rome. The first visit by a sitting pontiff to the Gulf focused on ongoing, interreligious dialogue at a time when religiously-fuelled tensions have caused problems across the world. The capital’s Founder's Memorial on Monday, which is dedicated to founding President Sheikh Zayed, witnessed an important moment in Christian-Muslim relations when Pope Francis and the Grand Imam of Al Azhar, Islam’s most prestigious seat of learning, signed a historic declaration of fraternity. Watched by a global audience of religious leaders from Christianity, Islam, Judaism and other faiths, they unveiled a document calling for peace between nations, religions and races. It is valuable sentiment in a region that has been wracked by years of war. The document also pledges that the Vatican and Al Azhar will work together to fight extremism, and includes sections on the need to uphold equal rights, women’s rights, freedom of belief and relations between the East and the West. 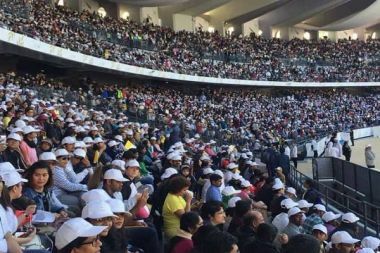 Assembled from 120 singers from churches across the Emirates specially for the event, a multinational choir sang together for the first time at the Papal Mass on Tuesday — a daunting task for even the most hardened chorister, but their rapturous sounds hit the right note. With the Mass — the first of its kind in the Gulf — broadcast across the Arab world, the event was a momentous occasion that united disparate communities. Rarely was that more succinctly represented than in the choir, with members representing the many nationalities, from Filipino to Indian, that make up the UAE's one-million-strong Catholic community, all singing together with one voice. 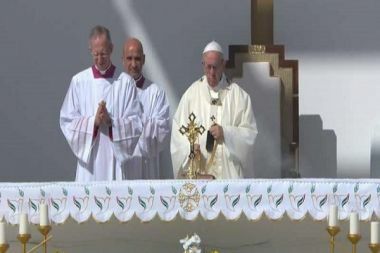 Following the signing of the Human Fraternity Document, Pope Francis gave a speech calling on the world’s great religions to reject armed conflict and any approval for the word ‘war’. He said the world will either build the future together "or there will be no future”. Pope Francis had a busy day on Monday, also visiting the capital's Sheikh Zayed Grand Mosque. During the visit, also broadcast across the Arab world, he met with the Muslim Council of Elders. The visit to a sacred place for Muslims sends a message of peace regardless of religion, culture or identity. 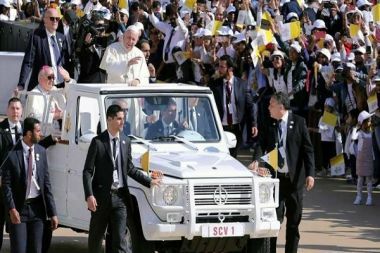 As the Pope arrived to crowds of adoring followers for his much-awaited Mass, a small girl, with streams of joyful tears running down her face, escaped security and ran up to his white G-Wagen. The pontiff stopped the car and blessed the little girl, who gave him a letter. It was a touching moment symbolising the importance of this visit to many of the UAE's faithful and the Pope's connection with his devoted followers. With Pope Francis having said prior to his trip that it was his mission to help establish more churches, two new places of worship are to be built in Abu Dhabi in celebration of inter-faith relations. Few details have been released, but they will be named the Church of Saint Francis and the Mosque of Grand Imam Ahmad Al Tayeb. 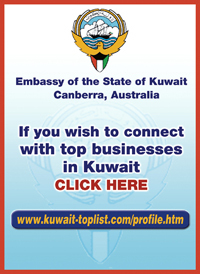 Pope Francis, Dr Al Tayeb and Abu Dhabi Crown Prince Sheikh Mohamed bin Zayed signed the foundation stones. Maronite Patriarch Cardinal Beshara Rahi on Tuesday highlighted the importance of the conference on human fraternity held in Abu Dhabi, stressing that its outcome will be salient for the entire humanity. Deploring those who have lost their humanity for the sake of wars and hatred, the Patriarch underlined the need nowadays of education, rapprochement and understanding. 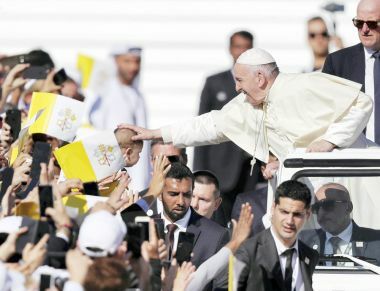 Moreover, Rahi hailed the visit of Pope Francis and Alazhar Sheikh to the United Arab Emirates, describing the two men as "great symbols of Islam and Christianity" who promote fraternity among religions.